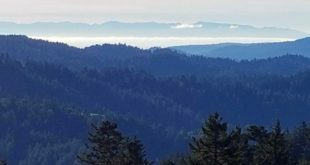 The Trail of the Ancient Oaks in the Russian Ridge Open Space Preserve is full of panoramic views; close-up wonders; and, of course, the magnificent canyon oaks. The Methuselah Tree. Over the years, I have bicycled and drove on Skyline Blvd a couple hundred times and I never saw this tree that is right off the road. It’s 14 feet in diameter, 44 feet in circumference, and 137 feet tall. It is 1800 years old.